The Raoul Janice Navy Patent Leather Shoulder Bag is a flapover style bag embellished with gold tone hardware throughout. 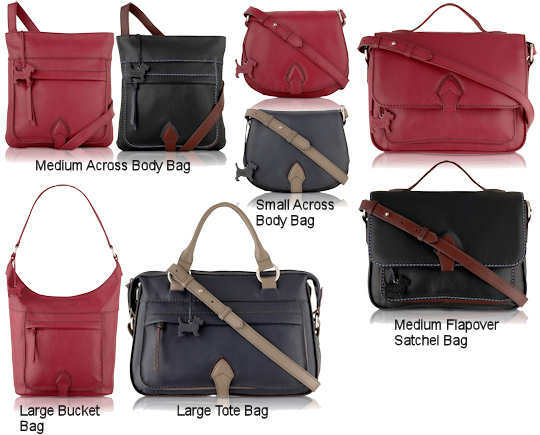 It has an eyecatching push lock fastening on the front and a long shoulder / cross body strap. Inside, the bag has two concertina edged compartments with a slip pocket and a zip pocket inside. 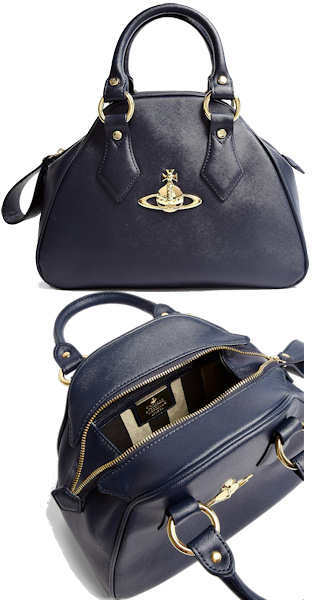 The bag is lined in matching navy fabric and there is a gold tone brand plaque inside. Navy patent leather gives a bag a special lady like quality. A certain demureness, perhaps and it’s a striking alternative to black. I have had people beg me to find them a navy patent bag and I’m very happy to see this version by Raoul for the new season. Make sure you don’t miss out on it.. 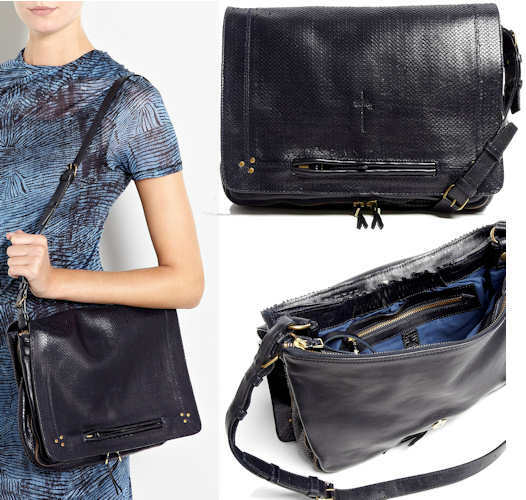 The Jerome Dreyfuss Albert Navy Snakeskin Bag is a calfskin leather shoulder bag, with an all over snakeskin print. The bag has goldtone metal hardware throughout and a buckle adjustable shoulder strap. The bag is a flapover style with a hidden magnetic clasp. The flap also features an external zip pocket and an embossed designer logo. Jerome Dreyfuss is something of a legend when it comes to his sumptuous, achingly cool handbags and it’s easy to see why. This navy bag will go with anything, and it will add style and a touch of luxe to any daywear ensemble. This new version of the Jerome Dreyfuss Raoul Bag features python print leather in natural, navy and blue creating a patchwork effect. The bag has two top zip fastenings with oversized zip pulls, a navy leather top handle and separate, removable, navy leather cross body strap. Gold coloured rivets embellish the exterior of the bag; indeed, all the metal hardware is gold coloured. Inside the bag, there is a zip pocket, together with a key fob and mini torch. The bag is fully lined in cotton. 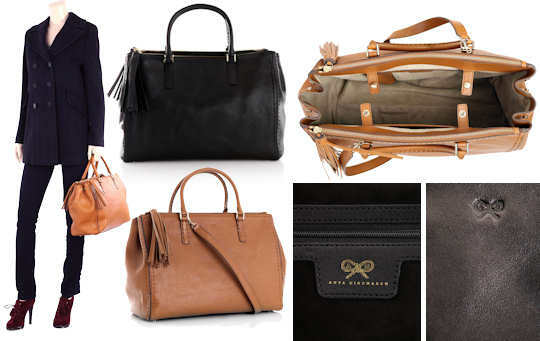 Jerome Dreyfuss bags have long been popular in the fashion world, and now they have made their debut at my-wardrobe.com. The Raoul bag is a classic and this new season version boasts sumptuous reptile leather in a patchwork combination which is both eyecatching and unique. The model in the photo has completed the look with a 3.1 Phillip Lim Pop Art Jumper and a pair of electric blue MSGM trousers. This Vivienne Westwood Yasmin tote bag is a mini version of this iconic style. Made from navy faux leather, the bag has a golden orb on the front. The bag has a zip top fastening with an oversized looped zip pull and there are studs on the base to help protect the bag from scratches. Inside, the bag has a striped cotton canvas lining. There is a zipped pocket and a large open pocket, together with a Vivienne Westwood branded golden plaque. Treat yourself to this diminutive version of Vivienne Westwood’s ever popular Yasmin tote bag. It’s a compact little number but its big enough for the essentials plus more besides. It’s actually deceptively roomy as although small, the bag is still quite deep. The navy colour looks fab with jeans and this bag will get your compliments wherever you wear it. The Anya Hindmarch Pimlico bag is made from high shine leather. It is a traditionally shaped handbag with two structured top handles. It also has a separate detachable shoulder / cross body strap. Details include the Anya Hindmarch signature bow which is embossed on the front of the bag. Inside, the bag is lined in a signature bow print lining. There is one main compartment which has a slip pocket, a key fob, a pen pocket and a zip pocket – this compartment fastens with two leather tabs. There are two additional smaller compartments down each side of the main compartment that are zip fastening with large leather tassel zip pulls. Style note: This bag has real celebrity style – Reese Witherspoon has already been seen carrying hers out and about in Hollywood. This is a proper, grown up handbag. 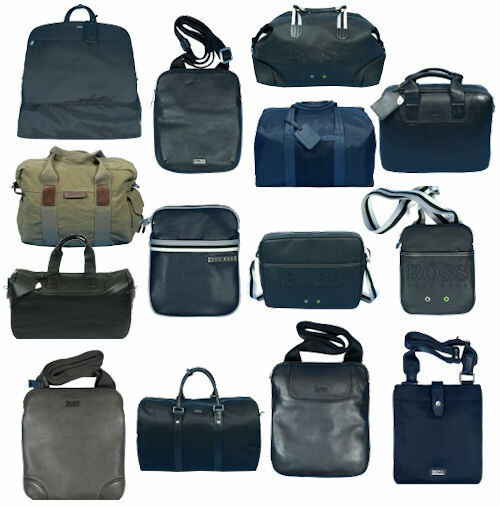 It has lots of compartments and pockets to keep you organised so it would make a great daily use bag. It’s style and shape are classic and timeless, so the bag should be considered an investment purchase. 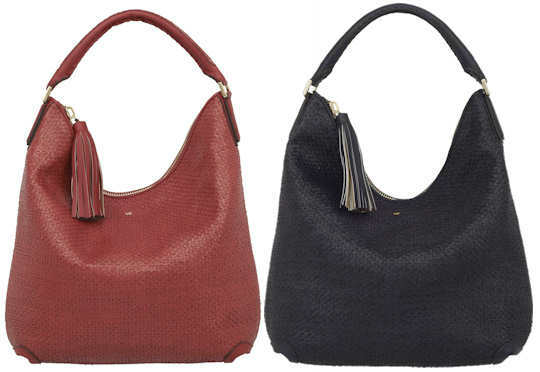 The Anya Hindmarch Huxley Hobo is a new addition to the Huxley handbag collection for the AW2012 season. It is made from buttery soft velvet calfskin leather which is woven. The bag is spacious, with a top zip fastening and signature tassel. It has pale gold metal hardware throughout, including a small but perfectly formed signature bow on the front of the bag. Inside, the bag has several pockets, which are labelled, to hep you organise your bits and pieces. 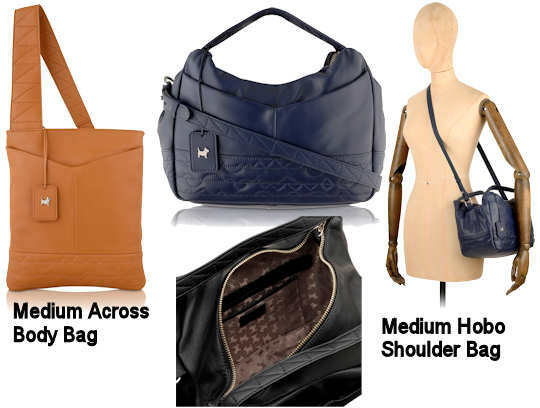 The bag has a single top handle and can be worn over the shoulder or carried in the hand. 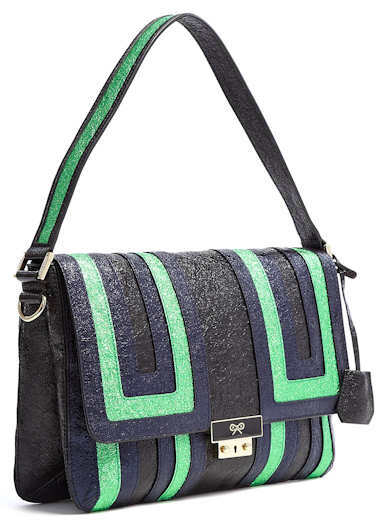 The Huxley is one of my favourite Anya Hindmarch handbags. I particularly like the length of the zip – it fits the bag perfectly and does not hang over the end. This gives the bag sleek lines and an chic silhouette. The new hobo version is perfect if you prefer to wear your bag over your shoulder, and the woven leather is truly special.